GP File 1 Police Affadavit Alleges Greenpeace Staffer Attended Urewera "Training Camp"
In a previous post I have detailed how the Green Party is intimately linked to the environmental activist group, the Save Happy Valley Coalition. On October 15th, police raided homes all over New Zealand, arresting 16 people allegedly involved in "quasi military" training camps in the Urewera mountains and one on drugs charges. No fewer than five SHVC activists or supporters, Ira/Tim Bailey, his sister Emily Bailey, Omar Hamed, Valerie Morse and a Swiss national who still has name suppression, were arrested in the October 15th anti-terror raids. While terrorism charges have been dropped, all five still face firearms charges. New Zealand's largest environmental organisation, Greenpeace also has extensive ties to SHVC. Several Greenpeace staff members have worked closely with, or inside SHVC in recent times. One of these, Kristin Gillies is a very recent addition to Greenpeace's Be The Change Team. He is currently touring touring the country in a bus, spreading Greenpeace's climate change message to high school pupils. One of his travelling companions, Jo McVeagh is also a former leading SHVC activist. 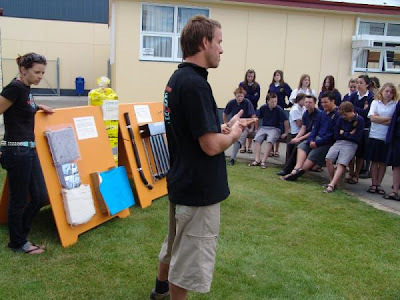 Gillies, a former Canterbury University geography student, has been a prominent member of SHVC's Christchurch branch. 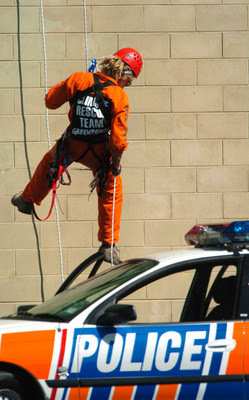 Kristin Gillies was arrested in February 2006 when he and fellow SHVC avtivists Raoni Hammer and Daniel Rae were removed from Solid Energy's Christchurch rooftop by twelve members of the Team Policing Unit. The Police had to smash a hole in a door with a sledgehammer to access the four storey high roof area and remove the protestors. Raoni Hammer has also worked for Greenpeace, where his climbing skills have been well utilised. In February 2005, Raoni Hammer was arrested following a nine day occupation of the Marsden B powerstation at Ruakaka, Northland. Hammer and three other Greenpeace activists climbed onto the roof of the main powerstation building in protest at plans to re-commision the mothballed coal burning power plant. Kristin Gillies has been active in training SHVC activists, including at a "non-violent direct action training camp" held in Christchurch in early October this year. The police affadavit used to obtain search warrants for the October 15th anti terror raids has surfaced on the internet. In it, police allege that Gillies may have undergone some "training" of his own. Police allege that Gillies travelled to the August 2007 Urewera "training camp" with the Swiss national and two others (both SHVC activists). Police allege that Gillies was observed attending this camp. The police affadavit alleges that according to InterIsland Ferry records, Gillies crossed the Cook Strait to Wellington on September the 7th, 2007 accompanied by an R.Hammer. This was several days prior to the alleged September Urewera "training camp". Police also allege that Gillies was sent a text message on September 20th 2007 from another SHVC supporter, later arrested on October 15th, advising Gillies and "Ra" of the dates of the scheduled October training camp. Gillies' Addington home was listed among those for which warrants were sought for the October 15th police raids. Inexplicably, when police attempted to search the Addington house, they were turned away by Gillies' alleged flatmate, SHVC national spokesperson Frances Mountier, because they failed to produce a search warrant! 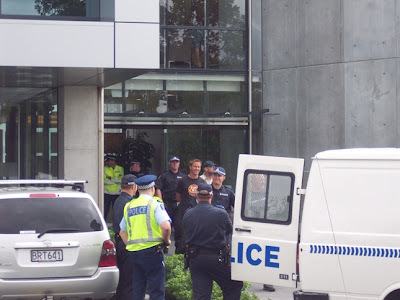 Greenpeace NZ is almost certainly aware that several SHVC activists and supporters were arrested on October the 15th. Are they also aware that their new Climate Change school campaigner is also alleged to have attended an Urewera training camp with Tame Iti and his followers? is it legal for you to be using police information? No, it's all sub-judice, so Trev's clearly in contempt. However, he could be just be making "assumptions" about what is in the affadavit, which isn't illegal. Thanks for clarifying the matter Sam Buchanan. I was under the assumption that Trevor was exposing violent seperatists operating in NZ. But thanks to you I now realize Trevor is a criminal and the violent seperatists are righteous citizens of NZ. You really need to either get your facts right, or stop blogging. Its pretty simple. a) Very few of the 5 arrestees you claim to be SHVC activists are in fact SHVC activists. b) That at least one of them NEVER has been. you persist in claiming otherwise. Hate to say it Trev, but I think I know a hell of a lot more about who is and isn't active in SHVC than you do. Commiewatcher-I knew their orientation, but not the pro SL bits-thanks for that. Asher, I still beg to differ. I believe all 5 have in some way supported SHVC-three of them substantially and two less so-but supporters none-the less. Which one do you claim has never been involved? Even if you were right about one person (and I am not conceding you are) that still makes 4 SHVC supporters allegedly involved in Urewera training camps and 5 if the police are right about Kristin Gillies. again it looks like your legal status could be very shakey for constantly publishing supressed material. So are Lefties calling for Trev's blog to be shut down? So much for "freedom of speech". The only ones who should be shut down are the people calling for blogs like Trev's to be closed. Who's calling for Trev to be shut down? I just think he should be honest that many of his 'facts' are guesswork, assumptions and hyperbole. I read a lot of fiction and enjoy it, I don't want it banned. And Reid, perhaps somewhere saying "Trev is in contempt" translates as "the Urewera guerilla insurrection is perfectly legal" (which by the way doesn't exist), but not in any language on this planet. Shining Path supporters club is a small lonely club. Kind of like Pol Pot supporters club. I didn't think you'd comment on my red herring comment but you couldn't help yourself. You claim a guerilla insurrection doesn't exist. The Urewera klan were not exercising their NZ gun rights. They were inspired by treason. The problem as I see it is you don't find their treason to be objectionable. Y I don't post my articles anywhere-what are you on about? BTW Sam B-if the insurrection did exist,would you admit it? The VLWC would not be a conspiracy if we let you in on it Trevor... you should know that much about conspiracy theories by now!